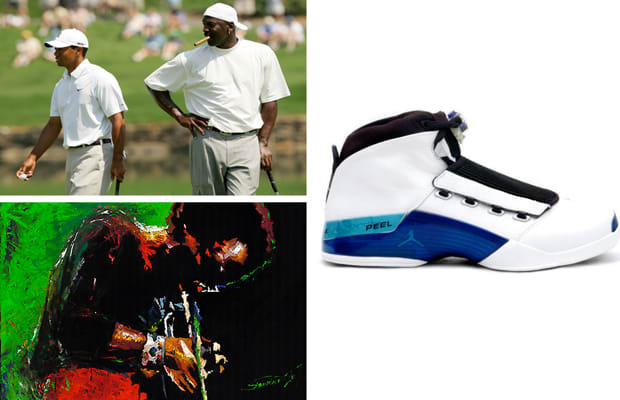 Complex Says: "Just like jazz, the story behind the Air Jordan XVII was all about improvisation — which is also why there are music notes molded onto the shoe and its contour is intended to resemble the smooth lines of a jazz solo. Though the body of the shoe is also modeled after the fine details of an Aston Martin, more interestingly, the sole of the shoe is based on the design of the Quail Hollow golf course in Charlotte, North Carolina — indicia of Michael's retirement and businessman-like attitude. So much for that second retirement, though, as Michael took to the court as a Washington Wizard rocking the XVIIs in College Blue."